AlkaLime is an alkaline mineral balance powder-based supplement formulated with essential oils to help balance acidity and ph. AlkaLime is an alkaline mineral balance supplement formulated with essential oils (in powder form) to safely balance the acidity of the digestive system. * This is important because a balanced pH allows the body to maintain vigor and health. 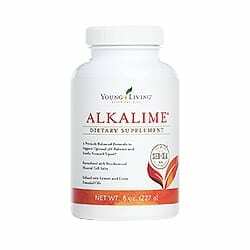 AlkaLime is a precisely-balanced alkaline mineral complex. Specifically formulated to neutralize acidity and maintain desirable pH levels in the body. Infused with lemon and lime essential oils and organic whole lemon powder. AlkaLime also features enhanced effervescence and biochemical cell salts for increased effectiveness. A balanced pH is thought to play an important role in maintaining overall health and vigor. Diet plays a huge part in achieving proper balance. This formula helps counteract over-consumption of processed sugars and foods that may turn to sugar in the body, such as pasta, bread, and processed corn products. The term pH stands for “potential Hydrogen”. This is the measure of hydrogen ions in a particular solution. For a simple understanding of this – and why: This refers to our body’s fluids and tissues. The pH scale measures how acidic or alkaline our body’s chemistry measures. The scale measures from 0 to 14. Seven is neutral. Below 7 becomes increasingly acidic, above 7 increasingly alkaline. How do I test the pH of my Body? Simple, do this test first thing in the morning when you wake, or have not eaten or drank anything for 30 minutes prior to testing. You can buy pH testing papers at a drug store, or Amazon.com. Simply spit on the color-coded pH indicator paper/test strip. Then match it to the chart to see where you are on the scale, noted below. If your pH is over 7.0 your acid-alkaline balance is good, meaning that you are alkaline. The lower the number, the more acidic your body is. Add one level teaspoon into 4–6 ounces of distilled water, mix thoroughly and drink immediately. Mix only with water. Take 1–3 times daily, one hour before meals or retiring to bed as an aid in alkalizing. Personally, I like to use this instead of Alka Seltzer. It’s chemical free and easy on my system. I use it to help eliminate heartburn and an upset stomach. I find that it works almost instantly! Try it for yourself. We offer a 30-day money back guarantee.